Chinese Minister of Energy Zhang Jianhua and European Commissioner for Climate Action and Energy Miguel Arias Canete during the signing ceremony at a EU-China Summit in Brussels, Belgium, April 9, 2019. European Union and China leaders say they intend to enter into what they called an “ambitious” comprehensive investment agreement by 2020. “We need to speed up negotiations on the China-Europe investment agreement, with a view of making decisive progress by the end of the current year so that we can conclude before the end of next year a high-quality China-Europe agreement,” Chinese Premier Li Keqiang said Tuesday at a news conference in Brussels. Li promised that European companies would enjoy equal treatment, adding that Beijing would no longer force companies to hand over technology in exchange for doing business in China. Aside from the timeline to reach a deal by next year, the promises Beijing made to the EU were similar to those it has made with the United States in trade negotiations. The announcement at this week's annual summit of EU and China leaders comes amid uncertainty over trade negotiations between the United States and China and threats by President Donald Trump of more tariffs against the European Union. Some saw the timing of the resurgence of tensions between the EU and the United States and the deal between Brussels and Beijing as a sign that Europe was gaining an upper hand. On Tuesday, President Trump threatened to impose tariffs worth $11 billion on European products. The European Union has not taken the same approach as the Trump administration – slapping tariffs on Beijing in an effort to squeeze market access concessions – but it shares the same concerns. But against the backdrop of U.S./China trade negotiations and tensions, the EU has been hardening its position as well. Ahead of the summit it sent signals that it was determined to see real progress in trade relations with China. French President Emmanuel Macron called for an “end to naivety” about Chinese power. Negotiations between the European Union and China were not easy, and it took the two sides 10-days to finally reach an agreement on a summit communique and the path forward. 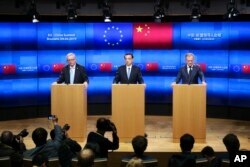 China's Premier Li Keqiang, center, talks to journalists during a joint news conference with European Council President Donald Tusk, right, and European Commission President Jean-Claude Juncker, left, during an EU-China summit at the European Council headheadquarters in Brussels, April 9, 2019. The EU also said China agreed to further reduce its negative list, sectors where foreign investment is banned. That is expected to happen in June. Although both sides promised to work to deepen reform at the World Trade Organization and support for the global trading system, the agreement marks a definite end to the WTO’s role, said China analyst Francesco Sisci. And while the two have a solid timeline to reach a deal, implementation is always key and timelines can change, he added. “On a positive note, China is proving more flexible, both with the U.S. and with the EU than we would’ve expected a year ago or three years ago. It is in a way perhaps proof that they are realizing there are issues,” Sisci said. Scott Kennedy, director of the Project on Chinese Business and Political Economy at the Washington D.C.-based Center for Strategic and International Studies, said that despite the agreement, progress is likely to be slow given the high priority the administration of President Xi Jinping places on the state in leading the Chinese economy. If the European Union can make progress on an issue such as state subsidies that could be a benefit to everyone, analysts note, but state support of state-owned enterprises remains a cornerstone of the Chinese economy and that is not easy to change. In the meantime, the deal does give China an opportunity to manage its relations with the European Union while it waits for the dust to settle after the 2020 U.S. presidential elections. “It is a way to kick the can down the road to see what happens with the U.S. and then see what happens next and they figure that by 2020 there would be some clearer outlook in the China/U.S. situation,” Sisci said.